The beloved “Olympic” colorway, which was first made famous by timeless Nike classics like the Air Jordan 7, the Air Force 180 and the Air Flight Lite, is set to return in 2019 on the oh-so-hot Nike Air VaporMax Plus. First jumping to prominence on the feet of the Dream Team at the 1992 Barcelona Olympics, the combo of red, navy blue and metallic gold became synonymous with the USA’s athletic dominance on the World’s biggest sporting stage — well, for sneakerheads, anyway. 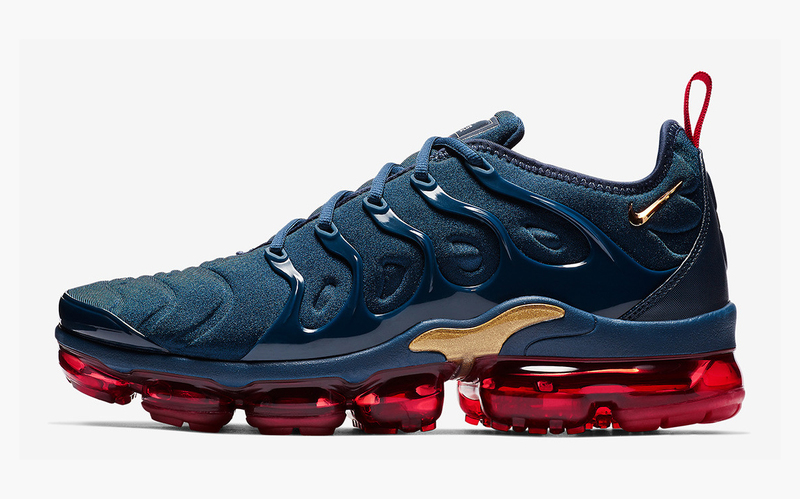 Set to arrive for the Winter, the “Olympic” VaporMax Plus gets decked out in the trio of aforementioned colors, with Navy filling the entire Neoprene upper and cage overlay, metallic gold riding the midfoot shank and Swoosh branding with red rocking out the entire bare-naked VaporMax sole unit. The Nike Air VaporMax Plus “Olympic” is set to release on January 5th, 2019 for 190 bones at select stores like Finish Line, SNS and direct from Nike.com. While you’re on the site, be sure to check out our Release Calendar to stay up to date with every upcoming release — and where to buy ’em!